Happy Friday Jet Setters! I hope you all had a very Merry Christmas with your loved ones. Christmas was a lot of fun this year with the boys, especially now that Richie is finally getting to an age where he's understanding the joys of it all! I can't believe it's almost New Year's which means, as we've done in the past, we'll be hopping in the car to have a little jet set getaway to the Adirondacks in upstate New York. We'll be checking out a lot of fun towns that I can't wait to share with all of you. 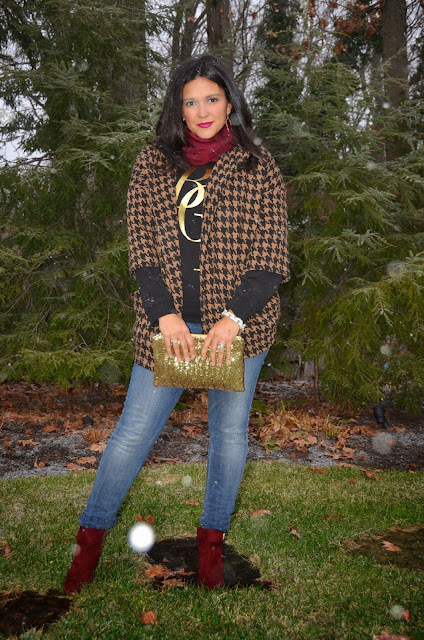 In the meantime on this Fashion Friday edition, here's a little sweatshirt and houndstooth jacket combo that I picked up recently at Forever 21. As a mom of two boys, I fell in love with the top. I actually bought the top, jacket and boots all at the same time, and didn't intend to wear them all at the same time, but when I took the stuff out of the bag I thought they would work together. Hope you enjoy!